1. Preheat oven to 350°. Spray both sides of chicken with nonstick cooking spray. In large nonstick skillet, cook chicken over medium-high heat 10 to 12 minutes or until chicken loses its pink color throughout and reaches an internal temperature of 165°, turning once. When cool enough to handle, cut chicken into 1/2-inch pieces. 2. Meanwhile, in large skillet, heat oil over medium heat. Add onion and cook 2 minutes, stirring occasionally. Add garlic and cook 30 seconds, stirring frequently. Stir in tomato paste and cook 2 minutes, stirring occasionally. Stir in salsa, chili powder, salt, pepper, paprika and cumin. Fold in rice, tomatoes and chicken; remove from heat. 3. Slice off 1/2 inch from top of bell peppers and reserve tops; remove seeds and inner membranes. Place peppers, stem side up, in 13 x 9-inch baking dish; add 1/2 inch water to dish. 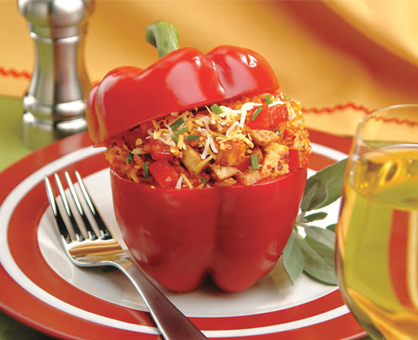 Fill each pepper with 2 tablespoons cheese. Divide rice mixture between peppers and top with remaining cheese. Replace tops of peppers, securing with toothpicks. 4. Cover peppers loosely with foil. Bake 45 minutes or until peppers are tender. Let stand 5 minutes before serving. Sprinkle with chives, if desired.